Things have been burbling along since all the drama in June. B self-injected an anticoagulant daily for a month or so but now he’s just on warfarin to keep his blood at the right consistency for artery healing. He’s still having regular blood tests to monitor it. A CT scan will happen in a few weeks. 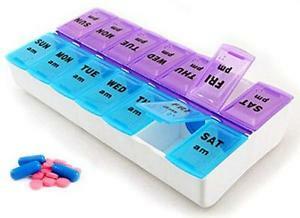 He’s now taking such a complex combination of medication that he needed to buy a pill box. Everyone knows that you haven’t ‘made it’ (illness-wise) until you have one of these. He takes great pleasure in filling it up every week. However he was despondent to hear that my dad also has a pill cutter. Breaking tablets in half manually is for losers! So that could be the next purchase or even a Christmas idea – what a great stocking filler. Imagine his thrilled expression on Christmas morning! When B was released from hospital we thought we’d have to cancel an upcoming trip to Japan. We thought there was no way he’d get travel insurance for that as well as his tumour. Turns out we were wrong. As it happened more than a month ago and didn’t result in a stroke, it only adds £20 to his premium. What a bargain. At that rate he could develop a few more conditions between now and then and we’d STILL be able to go (note to B – please don’t). Brilliant Jill! Your writing is so funny. Pill cutter one-upmanship, chuckle! Really glad your trip can go ahead. Just stumbled upon your blog and wanted to tell you that your boyfriend needs a chest MRI or CT Scan to visualize his WHOLE aorta. An echocardiogram cannot visualize the whole aorta. It’s very dangerous to have Marfan syndrome and not have the whole aorta visualized. Thanks for your message! It definitely isn’t confirmed that B has Marfan Syndrome – we’re still waiting for the test results. He doesn’t have enough physical signs for a diagnosis, so he may not have it. He may just have ‘Marfan tendencies’. Echocardiograms are not adequate to check for aneurysms in the aorta. Echos can’t visualize the whole aorta. You need an MRI or CT scan to visualize the whole aorta. Oops, sorry, didn’t think my comment actually posted last time. Thanks for the reply. Hopefully, he doesn’t have it!